Cinco de Mayo, or the fifth of May, is coming up soon! 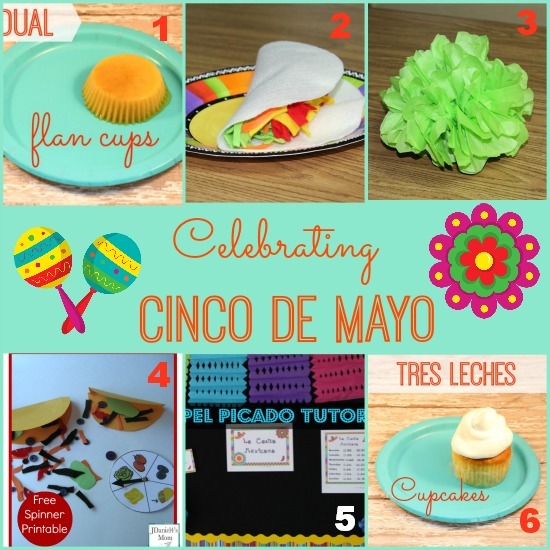 This is a big event here in Texas, so I thought I would share some ways to celebrate Cinco de Mayo at home or in your classroom. If you’re not familiar with this holiday, I hope you’ll stick around to learn more, you just might discover something fun or yummy! In case you’re not familiar with Cinco de Mayo, it was originally established to celebrate the victory of the Mexican army over the French at the Battle of Puebla on May 5, 1862. As with many holidays, this one has evolved over time and has now become a celebration of Mexican culture and heritage. This evolution is similar to that of St. Patrick’s Day. I’m no cook, but these little flan treats were too easy to pass up. They are the perfect size for preschool and kindergarten kids and they taste great too! Flan is custard with a yummy caramel sauce on top. I used a Jell-O flan mix that I found at my local Wal-Mart to make this recipe. Simply follow the directions on the box, and then pour the Jell-O into a muffin tin lined with tin foil cupcake liners. 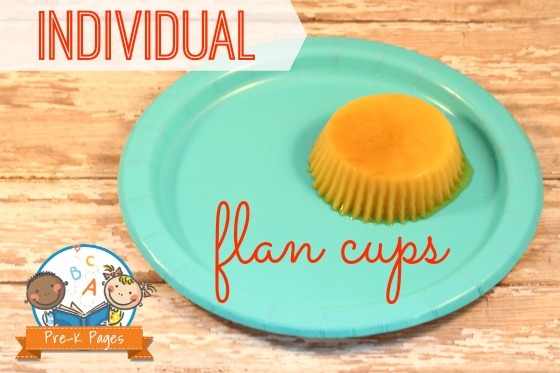 Set your flan in the refrigerator to cool and then place the mini-flans upside down on a plate- yum! The tin foil cupcake liners are key because they won’t fall apart and it will make getting your flan out of the pan and onto the plate much easier. 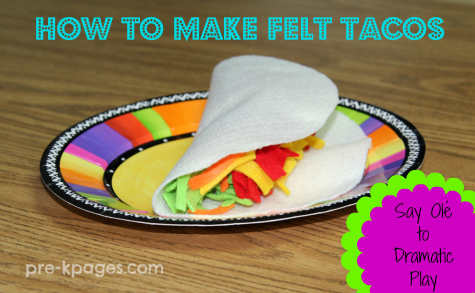 Teachers are busy people, we need ideas that are quick and easy and these felt tacos fit the bill! I whipped up some felt tacos for my Mexican Restaurant dramatic play center in only a matter of minutes. 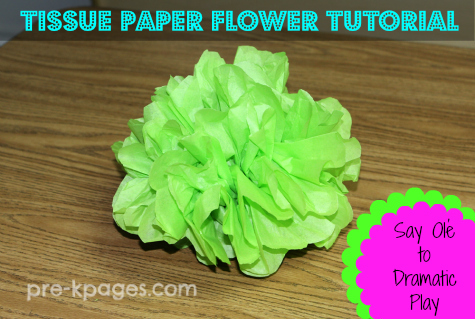 If you will be decorating for a Cinco de Mayo fiesta these DIY tissue paper flowers are a must! I never thought I would be able to make these but it was super easy, I felt like Martha Stewart when I was done! They really are much simpler and easier to make than they look. I absolutely adore this Taco Spinner game shared by Deirdre of JDaniel4’s Mom. She also includes a free printable so make sure to stop by and download yours! Another must-have decoration for any Cinco de Mayo party is papel picado, or cut tissue paper banners. These banners are extremely cheap and easy to make. 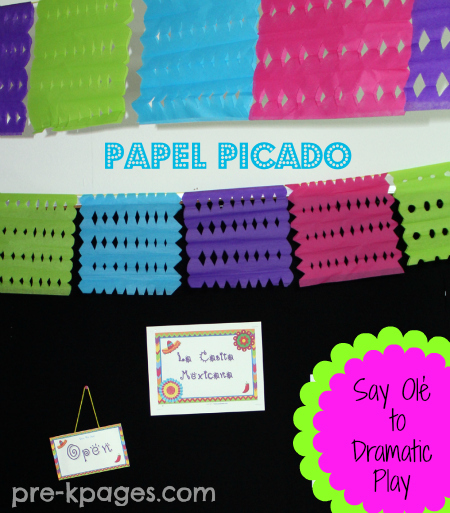 Colorful and festive, papel picado banners are sure to liven up your Cinco de Mayo party! If you’ve never had tres leches cake then you’re in for a real treat. I’ll let you in on a little secret; I’m not a big fan of cake, shocking isn’t it? But the first time I tasted tres leches cake I was in heaven! It’s super sweet and moist, what’s not to like? Tres leches means three milk in English, the cake is made with three types of milk so this makes perfect sense. True to form, I used a boxed tres leches cake mix from Wal-Mart to make these little beauties topped with Cool Whip. Just FYI, forks are a must for this treat. 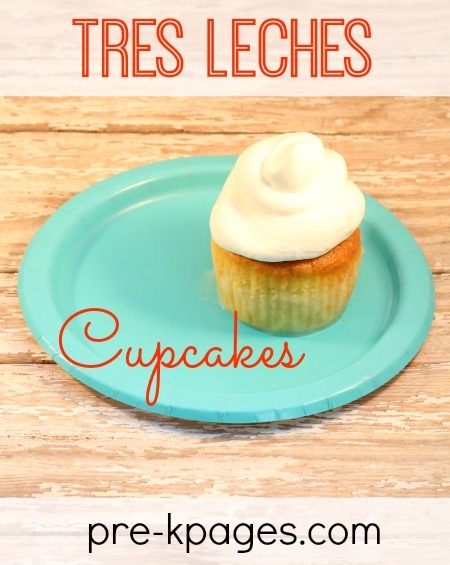 If your Wal-Mart doesn’t carry the boxed tres leches mix you can follow this super easy recipe from Betty Crocker. 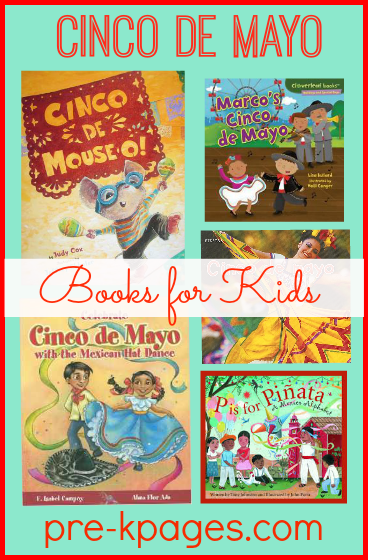 Here are some of my favorite kid friendly books on the topic of Cinco de Mayo and Mexico. Mouse goes on a hilarious Cinco de Mayo adventure- a must read! Follow my Cinco de Mayo board on Pinterest for more great ideas!